Astronomers have obtained an important first look at the dwarf planet Makemake – finding it has no atmosphere. 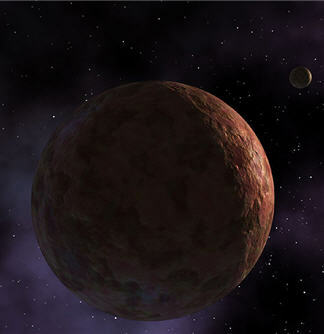 One of five such dwarfs in our Solar System including former planet Pluto, Makemake had until now eluded study. But in April 2011, it passed between the Earth and a distant star, and astronomers used seven telescopes to study how the star’s light was changed. A report in Nature outlines how they unpicked Makemake’s size, lack of atmosphere, and even its density. Few battles in the astronomy community are as fierce as the one surrounding the demotion of the planet Pluto from planet status in 2006 to one of what the International Astronomical Union then dubbed “dwarf planets”. Pluto shares the category with four other little worlds: Ceres, Haumea, Eris and Makemake. Ceres, as the only inner Solar System dwarf, has been analyzed directly with telescopes. The far more distant Eris and Haumea have both been analyzed separately in the same kind of “occultation” that has now given clues as to Makemake’s makeup. Haumea was shown to be icy like Pluto, while Eris added to Pluto’s indignities by ousting it as the largest dwarf. Now Makemake has come under scrutiny by an international team led by Jose Luis Ortiz of the the Andalucian Institute of Astrophysics in Spain, making use of seven different telescopes across Brazil and Chile. They watched as the dwarf planet blocked the light of distant star Nomad 1181-0235723, only for about one minute. The dwarf was known to be about two-thirds the size of Pluto, but the team put the measurement on a firmer footing, measuring it to be not quite spherical – about 1,430 km across in one direction and 1,500 km across the other. The team estimates that Makemake has a density of 1.7 grams per cubic centimetre (similar to that of Pluto, but still less than a third that of Earth) – but the key test was that of the dwarf planet’s atmosphere. “As Makemake passed in front of the star and blocked it out, the star disappeared and reappeared very abruptly, rather than fading and brightening gradually,” said Dr. Jose Luis Ortiz. “This means that the little dwarf planet has no significant atmosphere. It was thought that Makemake had a good chance of having developed an atmosphere – that it has no sign of one at all shows just how much we have yet to learn about these mysterious bodies.